Our Mission to provide innovative, efficient and reliable solutions to our customer's recycling and scrap handling needs. We strive to exceed our customers' expectations in quality, productivity, and cost through continuous improvement. As a customer centered company, we focus on our client's needs in order to provide turn-key solutions through custom design, manufacturing, installation and support. We take pride in our customers' success. In the early 1970s, we entered the recycling equipment industry, working to become the preferred supplier to numerous banks, paper packaging and scrap processors. By the late 1980s, we had provided hundreds of systems to recycling plants, printers, box plants, document destruction and manufacturing operations. Stemming from our experience repairing and servicing customer's machinery, we developed extensive knowledge in the rebuilding of balers, shredders, conveyors and recycling equipment. After witnessing numerous problems customers faced resulting from installing lower quality rebuilt equipment from other vendors, we focused on providing a better product. We committed ourselves to perform the difficult work other dealers only talk of providing. We perform this work with painstaking attention to detail. The result is premium-conditioned reliable equipment. We support this equipment with a premium warranty. 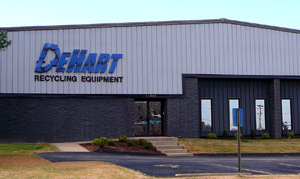 DeHart Recycling Equipment is synonymous with recycling equipment and expertise, as we have one of the most experienced teams of skilled technicians, project engineers and knowledgeable sales staff offering unequalled excellence in the recycling industry today. Sean Justen, with 20 years of industry experience, leads our sales, marketing and customer support teams. Kim Hayes, Our Inside sales support & Used Equipment Specialist. John Greider Jr., Our outside sales rep for Northern Missouri, Central Illinois & Southeast Iowa. John has years of customer service and industry experience as an equipment specialist. Ted Growe, Our outside sales rep for the Kansas City & Surrounding Area. Ted has many years experience in the Recycling Equipment industry with equipment such as balers, shredders, conveyor and many other types of recycling equipment. Dave Green, Our Service Manager with over 10 years experience. In June of 2008, we relocated our plant to a 26,000 sq.ft facility sitting on 3 acres near Lambert International Airport in St. Louis, MO. The new facility enhances our servicing and production capabilities.